Large US cable news companies are failing to cover the revolutionary rioting following the Iran election. Mousavi’s twitter account (I have no reason to believe this isn’t real, but let me know if you have further information) says that he’s under house arrest by the Ministry of Intelligence, and that internet and mobile networks were cut eight hours ago. Click through for more photos at TehranLive. – More photos here at mousavi1388’s flickr. Comments on where else to look for news are welcomed. There’s a bit more coverage of the news this morning, but still not that much. I’ve seen some speculation that by such blatant vote-rigging Ahmadinejad is trying to provoke civil violence to justify a crackdown – that he wants his own Tiananmen Square. Firstly, I’d be careful using ‘revolution’ to describe this. Hopefully the protesters are allowed to continue to voice their disappointment, but mostly it sounds and looks like there are massive amounts of police preventing this. Christiane Amanpour from the BBC is usually a good source of info on Iran, try her. 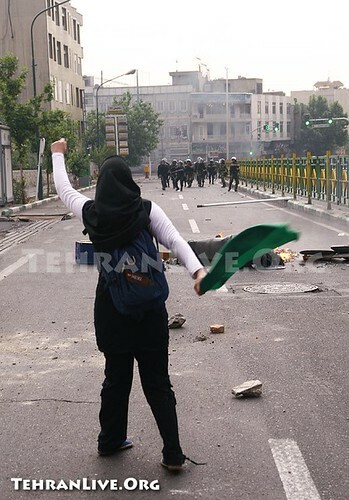 The biggest issue is that the people of Iran have no access to the communication systems which allowed them to gather peacefully before the “election” – mobile phones, social networking sites and even satellite TV (the only way to access non-state news) have all been blocked or attacked by the regime. Additionally, many web news sources have been hacked, it appears. The amount of news getting out of Iran despite the best efforts of the regime to crack down on it are heartening. The passion of the young people out on the streets demonstrating their rejection of the regime is amazing. A totally derailing thought, and perhaps worthy of its own thread: what, if any, are the implications for Conroy’s internet censorship campaign here of having such comprehensive censorship so readily bypassed by people who aren’t elite cybercrackers? Twitspam has a list of fake Irantweeters (arsehats or provocateurs) who are faking retweets and serving up disinformation.